For those that missed the early, early morning news. 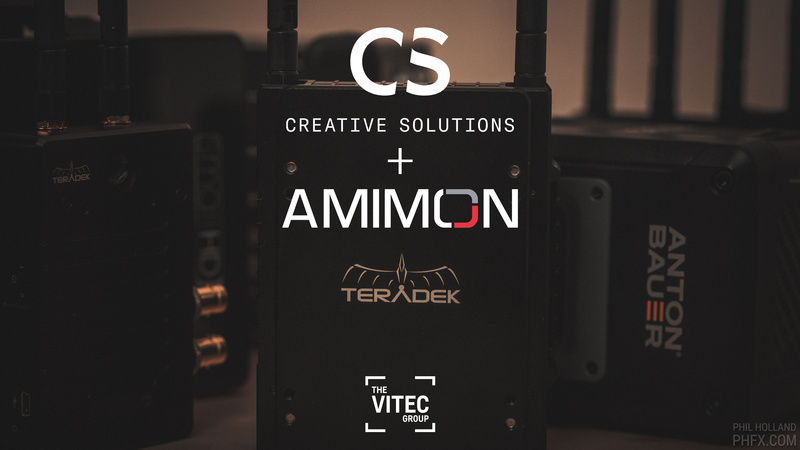 Vitec Group has acquired Amimon who's chipset is the patented core technology allows for transmitting high definition video signals wirelessly. This has been the backbone to Teradek's zero-delay wireless system as well as many others. Amimon will be part of Creative Solutions which will be a key point behind developing new and advanced wireless solutions moving forward. This is fairly big news industry wide and paves a solid road for wireless 4K in next generation's cameras and whatever else the future holds. Vitec's has been the driving force in some pretty big innovations we've seen in the brands that they oversea. In the last few years have been pretty notable in my mind as it's allowed for things like SmallHD creating larger and better monitoring experiences, Litepanels advancing well beyond where the original 1x1 was, and even more grounded advancements with unique technology behind the newer Flowtech tripod. But really seeing integration of technologies that usually were in separate worlds come together like Teradek, SmallHD, and RTmotion into devices like the 703 Bolt is the most interesting simplification. Gives you a big hint to where things are going accessory-wise on set. I wonder what will happen for companies other than Teradek and Paralinx that use Amimon's chips. Looks like TD/Vitec are really trying to take control of the market. A few things likely as much of this isn't totally general public knowledge. Amimon chips can be found in tech way outside of how we use it on set. Conversely, something strange has happened over the years where certain chips have been harvested from things like low price tv streaming boxes and similar and aren't totally clear for use in various regions due to regulations, yet some of those products have made their way to various markets. I won't name names, but that's been part of the battle to having actual approved, regulated, and safe technology on set. Many don't consider a great deal of that as price seems to be the leading factor to purchase, but there are subtle reasons you only see certain gear on bigger productions. Safety is a bigger issue than many think. To that, I think CS and Vitec will still sell "proper" chipsets to who they want, while likely leading the way in development of future-minded wireless technology for our purposes. They big think is they will have a bit of control of the not-so-savory efforts out there, which short of the chipsets still being harvested and gear imported in sketchy ways, will likely slowly go away. But some of those chipsets themselves have likely been copied now, despite being patented technology from Amimon before this acquisition. Time will tell for sure. For me what is exciting is during the next couple years we'll see some rather larger advancements to wireless on set. Now instead of just integrating chipsets you can produce new ones with more of a cinema and broadcast focus on the board. We'll have to wait and see. For the time being, and likely for at least a year, for us mere mortals; this probably changes nothing. But this isn't a now buy, it's a buy with the eye towards the future. I think the cool thing of consolidation like this is that it will force a lot of invention both within Vitec and in companies outside. This market has in many ways stood pretty still since Vitec bought Paralinx with relatively incremental updates. Now with this consolidation, the others are forced to invent as well instead of just buying prepackaged chipsets to distinguish themselves. It's really a win-win-win situation. I don't think we would have seen the price drops we have seen recently in wireless - or fresh, expanded offerings like the SDI-only Bolt without competition from some upstarts. Competition is good for the end user. It remains to be seen how this plays out. Smart move by Creative Solutions - I'm unconvinced that it will be of value to the end user. If Gunleik is right, and this forces others to invent chipsets, it will take time and money to do so, and that will drive up competitor pricing. I feel a little skeptical. I have 2 Teradeks, and they are both very fine pieces of equipment. But they have always priced their gear at a premium, and this move will allow them to keep prices high for a sustained period. Pretty lame. Teradek products are un-impressive and overpriced for what they are. Animon has been making their own products, and providing the chips to perfectly acceptable hardware (Like Cinegears) that often has better support, same results, and lower price. Most likely now I will get the privilege of paying even more for an Animon chip in a Teradek branded project box. Matt, I completely understand the various opinions on this, but I just want to make it clear that Amimon never supplied chips to Cinegears or many others like them. Those chipsets are illegally obtained, which is the reason why their pricing is so low. Remember, Teradek, ARRI, Paralinx, and a couple others had to purchase authentic chipsets at a price Amimon determined, which informed the MSRP you see. I no longer work on the cinema side of the company (im now doing product for our live streaming and IP video side), but I can assure you the plan is to bring more devices out at more affordable prices and with several new features. We want more people to use this technology, not less. Last edited by Mike Gailing; 11-12-2018 at 02:16 PM. Remember, Teradek, ARRI, Paralinx, and a couple others had to purchase authentic chipsets at a price Amimon determined, which informed the MSRP you see. When you consider that Amimon sells their own branded wireless systems and the 3000' version is only $1600, then you see just how much of a markup the Bolt 3000 is. Now, I know, Teradek pricing is higher because they were paying more for a 3000' chipset than Amimon, not to mention the better build quality and additional electronics inside a Teradek, but it certainly shows that a 3000' chipset costs well under $1600, yet the price delta between a Bolt 1000 and 3000 is $5000. With the bodies and electronics in a Bolt 1000 and 3000 being virtually identical, just the chipset change is accounting for the $5000 price difference between these Bolts, yet we can clearly see that the 3000' chipset costs way less than $1600 or else Amimon wouldn't have been able to afford to sell their kits (chipsets plus the supporting hardware) at that price. Just to show that this isn't just baseless speculation that has no basis on real world, 2nd party pricing and that Amimon isn't responsible for the $5000 markup due to the chipset, I submit the price difference between the Vaxis 1000 and 3000 units: $1500. I doubt Vaxis was getting a significantly better deal than Teradek for the wireless chipsets, so we can probably safely infer that Amimon wasn't responsible for the giant price jump between the Bolt 1000 and 3000 units. Teradek just has a huge markup because they can due to little competition in that market. Now, since this buyout can basically kill the competition by Vitec simply not selling the chipsets to them any more, I don't see a whole lot of motivation for Teradek to start selling cheaper, as they will have a monopoly on the market. At least with all the previous Vitec acquisitions, there are viable alternatives on the market, but not so much when it comes to wireless chipsets. I see Phil is optimistic, but -much like "trickle down economics"- I don't see this benefiting most of us. Having competition forces companies to innovate and drives down prices. Absent competition, where's the motivation for Vitec to spend lots of R&D dollars to improve the product? What's their motivation to lower pricing? People will have to buy Teradek regardless since it's more or less necessary to have wireless video these days and they'll be the only game in town. Now, don't get me wrong. I think Teradek makes nice stuff. Look at my signature, I have a Bolt system and it's worked great for me. I'm sure Teradek will continue to make good gear. But I'm not going to kid myself and pretend that this acquisition is great for the market. It's not. It's great for Vitec. But what's good for the corporation is rarely good for the consumer. It is interesting if "all but Teradek" are to be called "Cheap Chinese Copycats"
I know of companies that definitely have their own R&D departments and ambitions outside Teradek. I am aware of companies that sell whitelabeled solutions. So even if Cinegears is only whitelabelling some other manufacturers products, it doesn't mean that the chipset is greymarket. The current Teradeks/Amimons are 8-bit 422 on the receiving end and the meta-integration is in the early days to allow to do "more"with the wireless signal. Meanwhile I attended the SMPTE convention in HK a week ago, and 1080 8-bit 422 is not where connected workflows are moving. At all. So I think there is a lot of room for invention in this market and that it is not unlikely that Teradek buying Amimon will push inventions everywhere. I don't doubt that Teradek/Amimon have a lot of great tech on their shelves. Amimon had a revenue of 18,6 Million USD and a loss of about 700k last year. Being the dominating chipset supplier in this market, i guess this indicates a bit of R&D prior to the acquisition.